Are the Iran Nuke Talks Falling Apart? 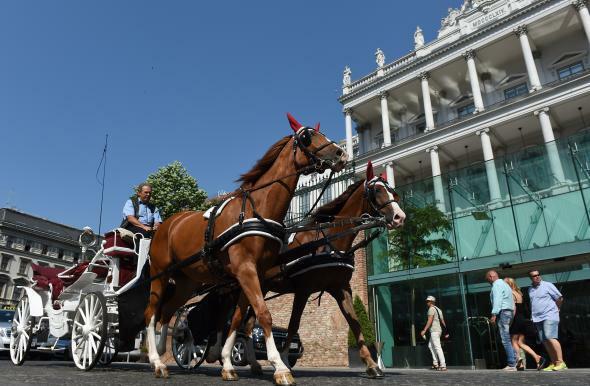 A horse-drawn carriage passes by Coburg Palace hotel where the P5+1 powers and Iran talks are taking place in Vienna, Austria, on June 12, 2015. The AP headline “Iran nuke talks impeded by disagreement on all main elements” doesn’t exactly fill one with confidence. It’s now looking increasingly likely that the talks in Vienna between Iran and the six world powers will be extended past their June 30 deadline. Nevertheless, there’s some cause for hope, if not quite confidence, that a deal will eventually be reached. It’s been apparent since the two sides reached an interim agreement in April that the main obstacle to a final deal would be the pace of sanctions relief. The framework deal was intentionally vague on when exactly sanctions on Iran would be lifted. The U.S. has insisted that sanctions relief be gradual, coming into effect as Iran complies with the terms of the agreement. This was essentially made non-negotiable in May when President Obama signed into law a bill giving Congress a month to review a deal before sanctions are lifted. Iranian leaders, most importantly the supreme leader, Ayatollah Ali Khamenei, have insisted that international economic sanctions on Iran be lifted immediately after the final deal is signed. But recent comments from President Hassan Rouhani suggest the Iranian position may be softening a bit. At a news conference over the weekend, Rouhani was asked about reports that Iran may have to wait up to a year for sanctions relief. “A one-year difference is totally untrue,” he replied. “It might be one month. We are still discussing.” The U.S. and its allies are likely to insist on a bit more than a month, but this still indicates more flexibility than previous comments by Rouhani, in which he insisted that same-day sanctions relief was a deal-breaker. The other side also hinted at a concession this week, with Secretary of State John Kerry suggesting that the U.S. might be willing to lift sanctions without Iran accounting for its alleged past scientific research on nuclear weapons. “We’re not fixated on Iran specifically accounting for what they did at one point in time or another,” Kerry said from Boston, where he is recovering from a broken leg. There are still major hurdles to overcome—particularly the question of what access U.N. weapons inspectors will have to Iranian nuclear facilities and scientists. Khamenei has rebuffed U.S. demands for full inspections, but it’s hard to imagine how Iran’s compliance would be certified without them. Iran’s disgraceful secret prosecution of an American journalist on espionage charges has also not exactly improved the environment around the talks. Both sides are still publicly committed to the June 30 deadline, but right now an extension looks likely. Things only get more complicated if the talks go past July 9: If Congress receives a deal after that point, the mandated review point doubles to 60 days. Given the amount of political capital both the Obama and Rouhani administrations have invested in these talks, they’ll stick with them for as long as it takes if there’s any chance of a breakthrough. But the longer it takes to reach a deal, the more chances opponents in both Washington and Tehran will have to torpedo it.